This flourishing matching set is of floral phoenix patterns and comes with an icon type Chinese character "Xi" (meaning happiness) in the center of the top. The ankle length skirt comes with a mid back slit. 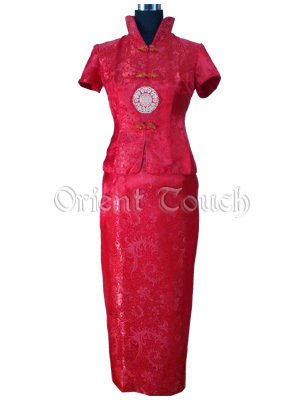 Decent and noble, it is perfect for wedding ceremony or any important occasion.